Russia, Ukraine, and the European Union have struck reached an agreement to resume supplies of Russian gas to Ukraine. Russian gas giant Gazprom will deliver 5 billion cubic meters of gas to Ukraine in the coming months on the condition that it pays off $3.1 billion in debt. Russian analysts say this means that Ukraine has tentatively agreed to Russia’s terms. An agreement has been reached to resume supplies of Russian gas to Ukraine, European Energy Commissioner Gunther Oettinger told the Russian news agency ITAR-TASS. According to Oettinger, at a trilateral meeting between Russia, Ukraine, and the EU in Berlin on September 26, Ukraine agreed to pay of $3.1 billion in debt, and in turn Russia gave the green light to supply Kiev with gas at a price of $385 per 1,000 cubic meters of fuel. However, this is a temporary agreement because the parties will have to revisit the issue in six months. Oettinger explained that Ukraine has to pay back $3.1 billion in arrears to Gazprom by the end of the year. Gazprom has committed itself to sending 5 billion cubic meters (bcm) of gas to Ukraine and giving it the option of a further 5 bcm. Ukraine will make the payments in two stages, the first of $2 billion no later than October, and another minimum of $1.1 billion by the end of 2014, the European Energy Commissioner said. According to Russian commentators, the terms of this preliminary agreement completely satisfy Gazprom’s demands. During the talks, the parties discussed a gas price ranging from $258 to $485 per 1,000 cubic meters, but in the end they settled on $385 by providing for a $100 discount, as Gazprom had offered. “The stipulated conditions are beneficial for Gazprom,” said Investcafe analyst Grigory Birg, adding that all parties to the negotiations are interested in this. Gazprom is interested in continuing gas sales to Ukraine, as well as in seeing Kiev and Brussels engage less actively in their policy of reducing energy dependence on Russian gas, Birg said. 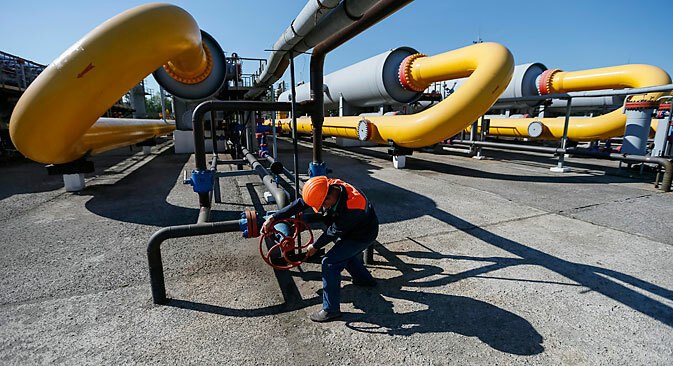 In his opinion, Ukraine is interested in remaining a reliable transit country for gas deliveries to Europe. “For this purpose, the country needs to continue pumping Russian gas into underground gas storage facilities in order to ensure uninterrupted transit to the EU and to provide Ukrainian consumers with ‘blue fuel’ during the winter heating season,” Birg added. In June of this year, Gazprom started asking Ukraine to pay in advance for its gas supplies. Since then, Ukraine has not been receiving gas from the Russian company because of its debt arrears. In Gazprom’s estimation, Naftogaz Ukrainy owes it a total of $5.3 billion. “Given that the EU is bearing risks, it is likely to shoulder Ukraine’s financial burden to pay for supplies, and it is extremely interested in seeing the issue resolved as soon as possible,” chief analyst at UFS IC Ilya Balakirev said. According to Oettinger, the final debt payments, which will depend on the ruling of the Stockholm court of arbitration, should be paid off no earlier than next summer. If Russia wins in court, $3.1 billion will be deducted from the total amount of debt. “Given that the parties have come to an agreement, one can assert that it is beneficial for both Russia and Ukraine; therefore, it would be wrong to say that either side has ‘won’,” said Dmitry Baranov, leading expert at Finam Management. According to Balakirev, Ukraine has said it is not going to pay off any debt but is willing to provide $3.1 billion as advance payment for future supplies. Balakirev said that the problem is that in the last half year Ukraine has demonstrated a chronic propensity for violating agreements, and it has not been fulfilling its obligations. “If Ukraine is able to spend the winter in relative comfort, then it is highly likely that this whole farce will repeat itself next year. It will not be a victory for Europe or for Gazprom,” Balakirev said. According to him, Gazprom will win if negotiations yield an agreement package that eases some of the requirements for the South Stream and Nord Stream pipelines, which offer alternative gas supply routes to Europe. Nord Stream, which passes along the bed of the Baltic Sea from Russia to Germany, is currently running at only half power, while the South Stream project along the bottom of the Black Sea has been temporarily suspended. According to the EU, this project does not fit the requirements of its Third Energy Package.